By Ian Chiu on 04/04/12 • Leave a comment! Mimo is a company that puts all its eggs in one basket – USB display. It has made its name known with bus-powered monitors that allow users to add an additional screen to a PC even when there’s no power outlet available. The latest mini monitor to further expand the Mimo’s niche product line is the Magic Touch. As the name suggests, the display supports multi-touch interaction, tracking up to 4 fingers. The display also gets all the power and connectivity it needs from a single USB 2.0 cable. Setting the Magic Touch is a no-brainer. You only need to download the driver from DisplayLink which handles automatic firmware update after installation. The display itself is as vibrant as it gets with excellent video quality. Interestingly, the latest driver hooks into your existing GPU for the heavy lifting. This dramatically reduces CPU usage and at the same time increases the 2D & 3D performance of the 10″ USB screen. It’s also a pleasant surprise to see the monitor can handle some casual gaming even though that isn’t what the Magic Touch is designed for in the first place. One caveat is that the glossy screen is prone to glare, making it uncomfortable when used in some bright environments. The best use for this display may well be for developers of multi-touch apps and perhaps a touch screen panel for Windows 8 desktops or HTPC. Get all the details of the Mimo Magic Touch 10-inch USB monitor in the full review below. By Ian Chiu on 03/29/12 • Leave a comment! On-board audio quality on notebooks and most all-in-one computers leaves a lot to be desired. Sometimes the audio quality is so bad users can barely hear anything without resorting to headphones or a bulky set of external speakers. Something that notebook or netbook users wanting improved sound may want to check out is the JLab B-Flex X-Bass Laptop Speaker reviewed at Everything USB. This rather unique one-piece speaker connects to computers via a USB port and is on a rigid flexible arm which means no excess cable on your desk and allows you to place the speaker for the best use of available space. The B-Flex X-Bass integrates a tiny passive sub-woofer, which is great for improving bass – something that is typically very lacking in on-board audio. The reviewer is also pleased with the surprising amount of sound it pumps out. The crisp highs and solid lows are equally impressive, considering the driver size. The X-Bass does have a few caveats such as lacking mid-range sound, minimal stereo separation due to the speaker’s design and it lacks an analog input for MP3 players. The little speaker sells for about $40, and is worth checking out. For people with all-in-ones, small form factor PCs and laptops, if they want an additional screen (or two), the best bet is an external video adapter which works work well for PCs lacking the space for an additional video card inside. Granted, some of these machines come with a HDMI jack but even with that, you only get two displays at most. The Targus USB 3.0 Dual Video Adapter is worth checking out if you want scalability. It simply needs one USB 3.0 port and has both DVI and HDMI to drive resolution up to 2048×1152 which is good display up to 24″. Should you want to further expand desktop estate, you can always get another one. USB 3.0 has plenty of bandwidth for applications like this. 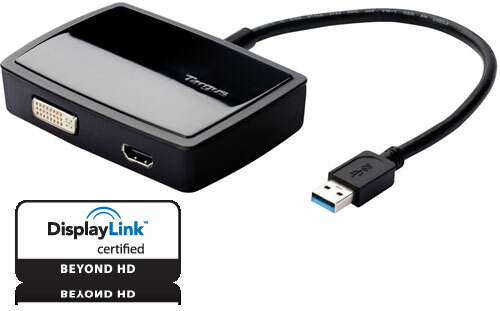 The Targus employs the DisplayLink DL-3900 chipset as it’s the only one in the DL-3xxx series to boast dual head output. Installation on Windows PCs is very easy and the adapter even gets HDCP 2.0 certification for Blu-ray and iTunes movies alike. The USB 3.0 video adapter can also carry 16-bit 48kHz 5.1 surround audio through its HDMI port. Another big plus is the DisplayLink USB video chipset being able to offload all of the heavy lifting of HD video playback and 3D rendering to the GPU. During Everything USB’s tests, the Targus adapter is actually able to render 3D game graphics as capable as the system’s main GPU. The USB cable, tethered to the adapter however, is strangely short and stuttering with 24p playback was noted. Despite the caveats, the Targus works well for most users and sells for about $99, making it reasonably priced by most accounts. Anyone looking to add monitors to their notebook or desktop computer for increased productivity will want to give this adapter a closer look. That is assuming USB 3.0 port is available. 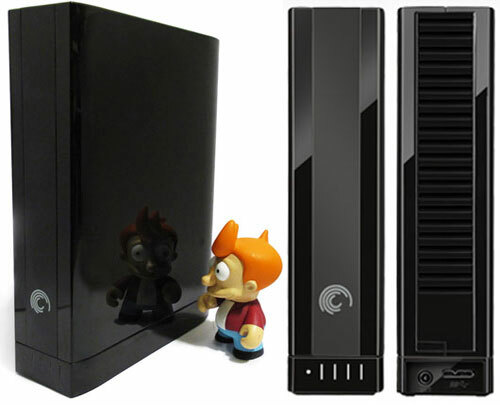 Seagate GoFlex Desk 4TB USB 3.0 Drive Reviewed. Verdict: Colossal Speed. By Ian Chiu on 03/22/12 • Leave a comment! We were already huge fans of Seagate’s line of GoFlex storage but they are now first to cross the 4TB barrier with their GoFlex Desk. For the uninitiated, the GoFlex line of drives allow for buying one drive with a specific connector (USB, FireWire, eSATA) and the ability to accessorize with each of the other types. FireWire at home and eSATA at the office, or just carry the connector with you if you don’t have a heterogeneous situation to solve. The large volume of the latest drive may appeal to many walks of life charged with toting the massive amounts of data that the GoFlex Desk 4TB enables. The interchangeable interface feature means that you can support the fastest possible manipulation of that data. Working with VMs or DB backups isn’t trivial with regards to size. Moving data on that scale can be downright glacial with older transfer protocols. 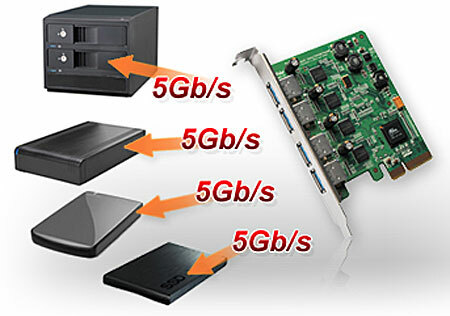 Seagate’s USB 3.0 connector has clocked some amazing speeds during tests and the USB 3.0 to SATA converter that runs the GoFlex Desk looks like it might work for other SATA drives in a pinch too. That’s a nice piece of added value but your mileage may vary. There are some possible problems working with data past 2TB, so do your research. Make sure you know which protocol you can use and where. You’ll also want to spend some time checking your OS’s support for 2TB+ drives. Older operating systems may require patching if they will even work at all. We’d check out this article for details about the speed and compatibility if you are planning a trip 4TB into outer space. By Ian Chiu on 03/19/12 • Leave a comment! The best you’ll do on most modern desktop computers for USB 3.0 ports today is one or two at most. Yet many PCs don’t even come with a USB 3.0 port. To take advantage of the massive SuperSpeed USB external storage and flash drives out there, desktop PC users don’t necessarily have to be looking to buy a brand-new rig to get additional USB 3.0 ports. Many motherboards have an x4 PCI Express slot tucked away inside that goes unused. HighPoint has a 4-port USB 3.0 PCI Express 2.0 card that pops into that forlorn slot and that provides a much needed USB 3.0 upgrade for a desktop PC. The only downside to cards like this for some users is that the computer has to be opened up, which could void warranties. The HighPoint RocketU has 4 discrete ASMedia ASM1024U controllers integrated giving each port full 5Gbps bandwidth. That means each port has access to the highest potential USB 3.0 speeds. Theoretically, this particular card offers a total of 20Gbps of data throughput. It has out-of-the-box support for both Windows and Linux; Mac Pro users looking for Snow Leopard or Lion support will have to check out the Mac version of the RocketU card. During everyday use, Everything USB found the ports are a bit too close together for multiple flash drives to use at once, but the card is still impressive. Read all the details in the full review. Corsair Vengeance 1500 Gaming Headset Reviewed. Verdict: Outstanding. By Ian Chiu on 12/12/11 • Leave a comment! It’s very seldom that virtual surround gaming headset gets such high approval but the Corsair Vengeance 1500 headset proved to be a real head-turner. This latest gaming-centric but still multipurpose headset has garnered high marks for sound quality and compatibility. Almost every physical feature of it has been upgraded. 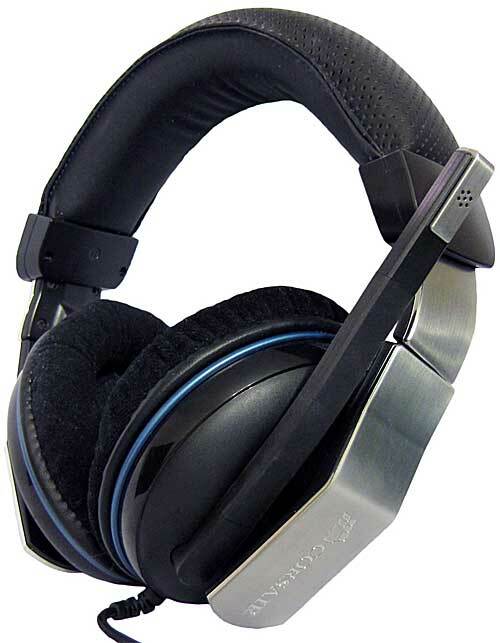 The padded ear cups fit better and are more comfortable than previous models and do an excellent job of sound isolation without actually requiring noise canceling features. The cable has a nylon mesh wrapping for tangle free flexibility but warns against unwanted feline affinity. The 5.1 and 7.1 audio driver flexibility seems to be the key feature of this headset allowing for compatibility for many old and new games alike. The 1500 provides game changing environmental awareness for games but movies and music are similarly enhanced. They appear to be very evenly balanced without favoring treble or bass. The reviewer actually seemed to struggle to find flaws with the Vengeance. In fact, the only complaints seemed to be around some of the nuances of microphone performance. Gamers that use the microphone for in-game communication are rarely concerned with music hall performance so that should be a non-issue for most. See the entire review at Everything USB for more details on this new prodigy from Corsair. By Ian Chiu on 12/02/11 • Leave a comment! 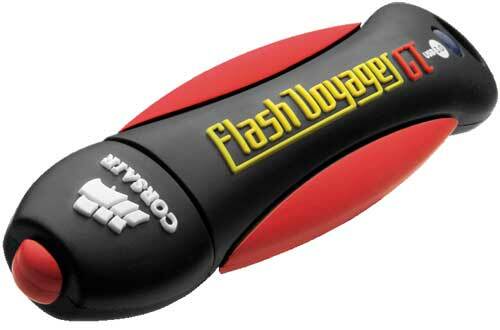 Corsair’s Flash Voyager GT line used to be the bee’s knees of ultra performant flash drives. Their SLC based 8GB Voyager GT from 5 years ago sat at the top of the USB 2.0 food chain for a long time. Sullied only by releasing an MLC based successor in 16GB (much slower than the 8GB) Voyager GT owned the land speed record nearly maxing out USB 2.0’s 40MB/s bus speeds. Fast forward to present day with USB 3.0 well at hand and the latest Corsair Flash Voyager GT 3.0 arrives, not with a roar but with a whimper. Boasting almost only above average read and write speeds for placing it just above the middle of the road at 135MB/s and 83MB/s respectively. While this is certainly faster than most of the junk flash drives you will find on most shelves, Corsair is an enthusiast drive maker and has to be held to higher standards. They are currently leading the pack with their Force SSD and Revo drives, they should show flash drives some more love. Mediocre USB 3.0 speeds aside, all the other time tested features of the Corsair Voyager line remain. The durable rubber coating still seems protective enough to survive multiple trips through the dryer without a glitch. It’s still too big to share close quarters with other USB devices but it’s not supposed to be compact and cheap, it’s supposed to be big, fast and spacious for very demanding users. To get a full report on where its speed compares to other market devices as well as form and function head to Everything USB. Wacom Bamboo Capture Multi-touch Tablet Reviewed, Verdict: Loaded Bargain. By Ian Chiu on 11/25/11 • Leave a comment! There are two types of technology advancements that make headlines; new things that no one has ever seen before and breakthroughs in price that generate novel ways to implement existing technology. 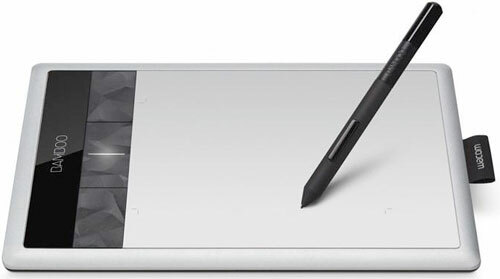 The Wacom Bamboo Capture tablet is the latter, thanks to its groundbreaking low price. At under $80, this will be the first tablet that many aspiring artists can afford. Most pressure sensitive graphics tablets start well over $500 and that price can keep people using pen and canvas. The combination of software and hardware package with the Create is impressive. Somehow, Wacom has managed to stuff high end graphics tablet features in this inexpensive package. The tablet responds to both the included pen and finger touch. It can detect up to 1024 distinct levels of pen pressure for dark or light strokes on the fly. It has 4 buttons that are programmable but unfortunately not application aware. The big value-add shows up in the software that’s included with the tablet. Besides the custom Wacom that’s included, you also get Adobe Photoshop Elements 8. The list of software and features goes on. If you’re interested in what else is included or how it performed, check out the review at Everything USB. By Ian Chiu on 11/17/11 • Leave a comment! 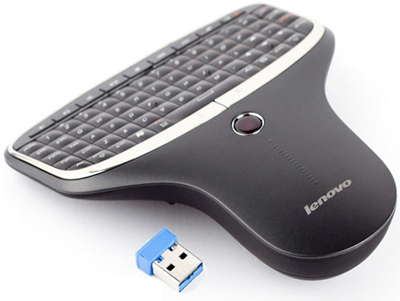 Lenovo recently updated their paddle HTPC keyboard and the changes aren’t subtle. It already had a hit on their hands with the first generation of this very hand-friendly Multimedia Remote Keyboard and trackball. The tiny trackball has been replaced with an optical sensor that first made waves on the Raon Everun a few years back. The very responsive sensor also doubles as left click mouse button for very relaxed use. The nano dongle and the key layout are mostly unchanged. Most of the device has also been upgraded from slippery gloss finish to a more gripping rubber texture, only the keys remain glossy. Other improvements include automatic backlighting and raised bumps on the keys for tactile navigation. The mouse buttons have been widened for larger hands to operate without adjusting their grip. The nano USB dongle can be stored in the battery compartment for travel which may be the only time you ever open it. The very strong wireless connection boasts a battery sipping 3 months of life. Other similar keyboards suffer from weak signals but the Lenovo Remote shows no sign of losing connection at even extreme ‘same room’ distances. Check out the full review at Everything USB if you are interested in how the remote fared after extended use.